Once again, we were privileged to celebrate a child’s baptism at the church in worship on September 25. Young Rocco and his family joined us as we continued to explore the meaning and relevance of some of the idioms that have found their way into the English language as a result of the King James Bible. The texts for the day included Lamentations 3:13-26, and from the King James Bible, 2 Corinthians 12:7-10. “A thorn in the flesh”. According to dictionary.com, that means, “a source of continual irritation or suffering: That child is a thorn in the teacher’s side.” As we wander through the more than 250 idioms that have entered the English Language as a result of the King James Bible, my hunch is that this is one that is familiar to you. Have you heard that saying before? Even if you’ve never heard it, if you’ve ever had a splinter in your finger, or a rock in your shoe, or a buzzing in your ears, you know exactly what this phrase means. “A thorn in the flesh” is indicative of a pain that just won’t leave us alone, or a discomfort that is seemingly endless. In popular culture, the phrase is well known: it’s used in the titles of many books, as well as in songs performed by the Eurythmics, Quicksand, and the Subdudes. Earlier this week there was a news article that referred to former New York Mayor Ed Koch as “a thorn in Obama’s side”. The saying comes, of course, from the letter of Paul to his friends in Corinth, although it’s possible that he himself may have borrowed it from the Old Testament book of Numbers, where God warns the Israelites: “But if ye will not drive out the inhabitants of the land from before you; then it shall come to pass, that those which ye let remain of them shall be pricks in your eyes, and thorns in your sides, and shall vex you in the land wherein ye dwell” (Numbers 33:55, KJV). Exactly what Paul meant by “a thorn in the flesh” is a mystery. In fact, the theories are endless. Some scholars say that the thorn was the hostility and beatings he endured as an apostle. Others use this passage to say that this proves that Paul was going blind, or was epileptic, or fought against homosexual temptation, or was subject to fits of rage and temper…and those are just six of the more common explanations – there are literally hundreds of ideas as to what was meant. Regardless of what specific circumstance in his life Paul is acknowledging here, the meaning is pretty clear: things are going pretty well, and then the devil comes along and does his stuff and now a formerly perfect picture is marked by pain. Have you ever felt that way? Your life is going along pretty well, and then all of a sudden the evil one interrupts that flow and you find yourself in dis-ease. You are angry at the devil! It’s interesting to note that the Old Testament Reading is just about the opposite of Paul’s situation – almost like a photographic negative, where everything that was dark is light, and vice versa. 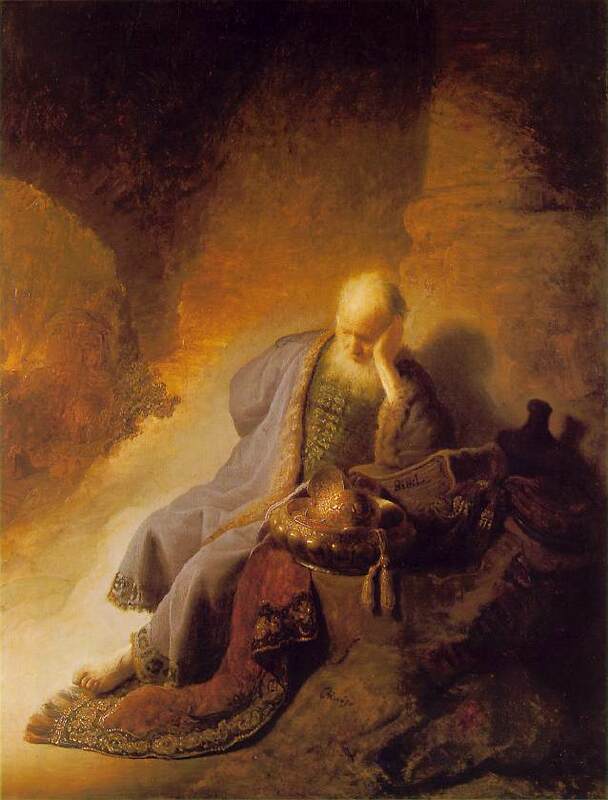 The book of Lamentations is thought to be the work of the prophet Jeremiah. This man had the unfortunate nicknames of “the weeping prophet” and “the reluctant prophet”. For years and years, Jeremiah told the people of God what they did not want to hear. Finally, the predictions come true and the prophet finds himself looking at his beloved Jerusalem, lying in ruins. Everything about Jeremiah’s life, he says, is terrible. Who’s fault is that, according to Jeremiah? Now, I have a friend who uses pronouns rather indiscriminately, and when she talks about “him”, I’m never quite sure who she means. There are several “hims” in her world, and about the best I can hope for is that I’m not the “him” she is currently angry with. But with Jeremiah, there is no such confusion. I only asked you to read starting at verse 13, but if you go back to the beginning of this chapter, you will see that Jeremiah blames his misfortune on “him” at least 18 times. “He” has driven the prophet into darkness, and made Jeremiah’s skin waste away and has blocked Jeremiah’s path. “He” is a bear lying in wait and a lion in hiding. “He” has shot an arrow into Jeremiah’s vital organs. Who is “he”? It is God. Jeremiah looks around and sees his life as a shambles, and he carries the load of blame and places it squarely at the feet of God. Who has caused my life to be so miserable? It’s the Lord. And so the Bible explores the problem of evil. Why do bad things happen? Why is there pain in the world? 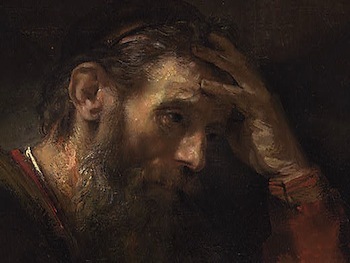 Does God cause suffering? If not, can he prevent it? Why does he allow it? So far as I can tell, there is not an unambiguous answer in the Bible. In Job, we see that Satan is clearly blamed for causing all kinds of agony (although he has God’s permission to do so). In Exodus, we read that much of the suffering connected with the plagues sent to Egypt is a result of the fact that the Lord hardened Pharaoh’s heart. In Isaiah, God sends the foreign enemy to punish a disobedient Israel, whereas in James, we read that God does not tempt people with or towards evil. In the Gospel of John, Jesus’ disciples want to know whose fault it is that a man is born blind. Who is responsible for the adversity he encounters every day? “Whose fault is all this evil?” is not, so far as can tell, a very helpful question for those of us who confront evil on a day-to-day basis. Look at this: my father died of cancer. Like many cancer victims, he smoked. A lot. And my friend, who I’ll call Sally, has been fighting the evil cancer for several years. And she has never smoked. Ever. Do you see? When it comes to the question of evil in the world, the Bible is ultimately concerned with you and I having the assurance that no matter where we are or what the situation, we are within God’s grasp. We will get through it. And I hope that for some of you in the room, this is a word of encouragement. You might very well be in a hard place right now. Perhaps, like Jeremiah, you feel as though your world has collapsed. You’ve had terrible news regarding your job or your health or your family. You have been devastated. Perhaps, like Paul, you are struggling with one particular relationship, or trying to become free of a certain habit or, well, ‘thorn in the flesh’. The good news for you is that you can get through this. The ultimate story is that evil, pain, and chaos does not win in the end. As the old hymn says, “This is my Father’s world! O let me ne’er forget that though the wrong seems oft so strong, God is the ruler yet.” God reigns – in power and in glory, and that’s good news! Beset as you are by pain or disease or irritation, you have the ability to choose, to trust, to move forward in relationship with God. And even on that day when death wins its little battle with you or with me, we hold fast to the truth that pain and death do not get the last word. We are resurrection people, and God has infused this creation with resurrection power. So take heart, church! Be encouraged! And at the same time, this is a word of challenge for those of us who are not, right now, in particularly hard places. It is a word of challenge for those of us who are parents, or grandparents, or who answer baptismal questions on days like today. I just said that God’s people have the ability to choose, and to trust, and to grow. That’s true. How do we get that? How do we foster the ability to do those things? How do we encourage, or engender, faith? For Jeremiah and Paul, it would seem that memory is a key factor. When confronted with deadly pain and evil, they both reflected on truth that they already knew. Someone taught Paul and Jeremiah about the nature and character of God. 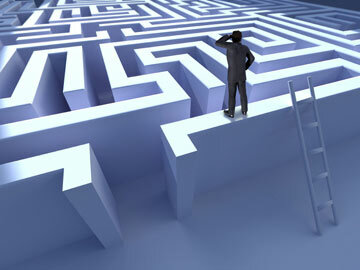 When the tough times hit them, the things that they already knew helped them to get through the difficulty. 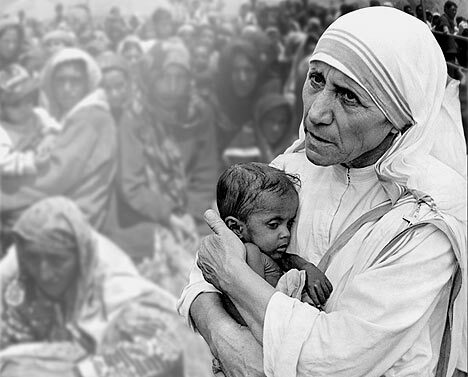 There were, for each of those saints, people who spent years teaching them about the love, mercy, faithfulness, goodness, strength, graciousness, and power of God. Who will teach the children of this community these eternal truths? How can we shape these young spirits so that when the tough times come for them – as you know that they will – the children we love and serve will have access to the same resources that saved Paul and Jeremiah? Today, we baptize Rocco. That’s a great thing for him and for his family. But how will he remember that? Who will help him to remember the truths in which he has been anchored? I suppose that I haven’t really thought about it before now, but it occurs to me that when I started to preach this series of messages that are rooted in the ways that the King James Bible has affected our language, I was in some way extending a “thank you” to all those people who have given me an appreciation for the beauty and truth and power of God’s word. I am grateful for the people who taught me time and time again about Daniel and the lions and Noah and the ark; for the women who drilled parables and miracles into my skull; for the men who probed my questions about the interpretation of scripture; for the saints who listened to crazy ideas and bad sermons and long youth group lessons. I am grateful, profoundly grateful, for the people who were there for me. And I promise to stand with those who are following me. And today, it is my privilege to stand with you as one of those who remembers who we are, who God is, and where we are heading…and who will seek to give that memory to the children with whom God has blessed us. Thanks be to God! Amen. We are continuing our sermon series that commemorates the 400th anniversary of the publication of the King James Bible. Today’s message was based on Jesus’ blessing of the children (found in Mark 10:13-16). 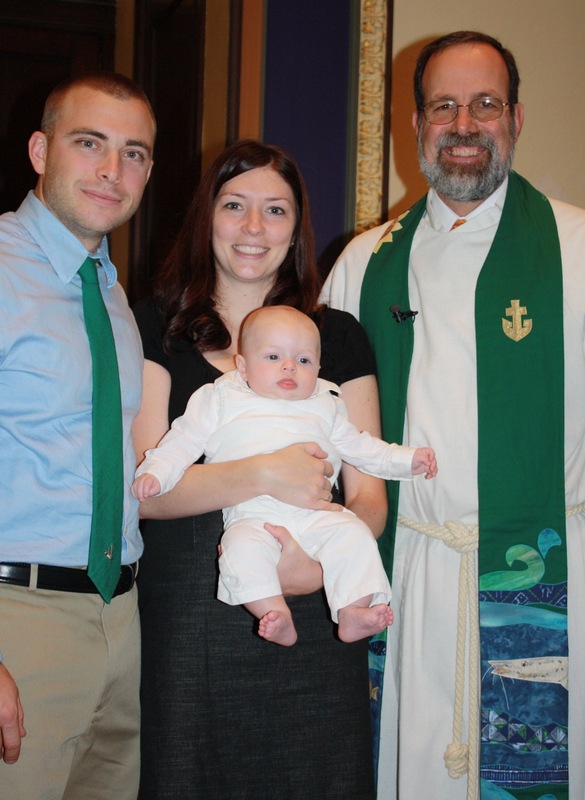 One special aspect of our worship today (September 18, 2011) was the baptism of young Tranter James – who happens to be the sixth generation of his family to be a part of the ministry of our congregation. I have had the good fortune of being in some amazing places in the world. I know, and do not take for granted, the fact that I’ve seen things my parents only dreamed about. I have never been to the Teton Wilderness Area in Wyoming, but I want to go there. I don’t want to go because the fishing is great (although it is), or because there will be new birds to find (although there will be). I want to go so I can stand in this creek. This is a little stream called Two Ocean Creek. It begins high in the mountains on the Continental Divide, and then at this particular spot, it splits into two. If you were to follow the fork to the right, you’d find yourself in the Snake River, and then the Columbia River, and some 1353 miles later, swimming in the Pacific Ocean. However, if you took the fork on the left, you’d wind up in the Yellowstone River, then the Missouri River, the Mississippi River, and finally, 3348 miles later, the Gulf of Mexico and the Atlantic Ocean. At any given time of the year, depending on rain, ice melt, and so on, each branch of Two Ocean Creek is between three and six feet wide. So let’s say that you put a message in a bottle a hundred yards upstream from this spot. Think about where it could end! It might wash up in San Diego! Or Boston! Or Rio de Janeiro! Or Tokyo, Japan! And what would determine the path of that bottle? Well, initially, it would be something very, very small, wouldn’t it? 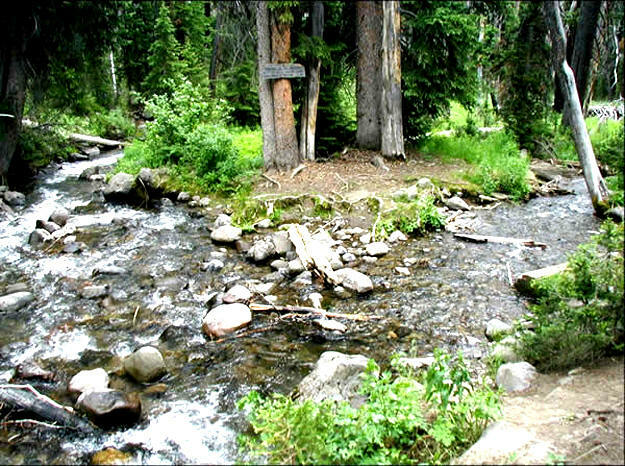 Which fork of this creek does your message follow? Atlantic or Pacific? It depends on the wind direction. On the placement of a couple of small rocks on the bottom of the stream. On whether or not there is something blocking the path on one side or the other just ahead of the fork… Some very small, seemingly insignificant factor could make a gigantic difference in the path that your message would take, wouldn’t it? This idea of a small consideration making a vast difference lies at the heart of today’s reading from the Old Testament. For those of you who are visiting today, let me tell you that we are in the midst of a series of sermons exploring some phrases that have come into common English usage as a result of their presence in the King James Bible. 2011 marks the 400th anniversary of the publication of what has been called the most influential book in the English Language, and many of us use portions of scripture without ever knowing that we are, in fact, quoting old King James’ translation. More than 250 phrases, like “not by bread alone” (MT 4:4), “a still, small voice” (I Kings 19:12), “to everything there is a season” (Eccl 3:1), “how are the mighty fallen” (2 Sam 1:19), or, even earlier this morning, “suffer the little children to come…” (MK 10:14) are in our minds because 400 years ago, the scholars who translated the King James Bible coined those phrases. While the phrase “a fly in the ointment” is not literally found in the Bible, virtually every linguist I could find tracks its origin to this quote from Ecclesiastes. Have you ever used that phrase? When someone tells you, “Well, that sounds like a good plan, but there’s a fly in the ointment…”, do you know what they mean? Usually, it means that there is some small detail that could end up causing significant shifts to your plans, right? The metaphor works, of course, because usually something as small and light as a fly can land and do whatever flies do, and then leave without a trace. However, if a fly touches down on a sticky substance, then things change. The phrase is strengthened in its meaning by using the word “ointment”, which is not merely a tacky substance, but carries with it images of healing and sacred uses. And in 1611 – and for much of human history – flies were thought to be representatives of the devil himself, harbingers of evil. And so for a fly, dead or alive, to appear in any kind of ointment or balm would be a great irony and tragedy. The point of the text, simply enough, is that it doesn’t take a giant error to really screw up your life. Oftentimes, it’s a small decision (“a little folly”) that leads to a mighty downfall. You know exactly what I’m talking about, don’t you? You’ve hit that “reply all” button on an email prematurely. You sent a text that 2.8 seconds later you would have paid incredible amounts of money to unsend. You’ve said things in arguments that you wish you could unsay…you said “yes” to a drink or a drug that you know changed your life…you planned the perfect party, and then forgot to invite that special friend…you had a presentation all ready for work or for school, but forgot the flash drive with your show on it…right? That’s a “fly in the ointment”. It’s a little thing that has had a big effect on your life, right? And usually, “a fly in the ointment” refers to something bad that has (or is about to) happened. A small mistake leading to a major tragedy. But I’m here to tell you that it works in reverse, too: that taking minor and seemingly insignificant steps for the good can lead to very positive things in our lives, right? I mean, we have the option of training our children – of training ourselves – every day to be people of faith and integrity. In the little things that we say and do, the seemingly inconsequential actions of our daily lives, we can determine what kinds of people we will become. Isn’t that what lies at the heart of the Gospel reading you heard earlier? Mark describes a scene where some people in the crowd were trying to bring their babies to Jesus so that they might be blessed. His friends say, “What are you, crazy? Jesus is big time. He’s important. 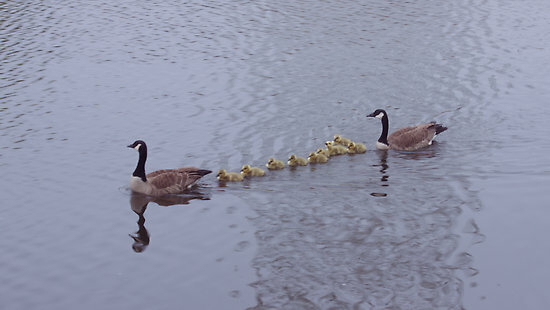 He doesn’t have time to be blessing any babies!” And, as you heard, Jesus seizes upon their behavior to teach them a lesson about what it means to be childlike in the Kingdom of God. It’s a teachable moment for the disciples and the crowd. You know that story. But as I read it over and over again this week, I wondered, “Why?” Why do people bring their babies and thrust them into the hands of famous people? 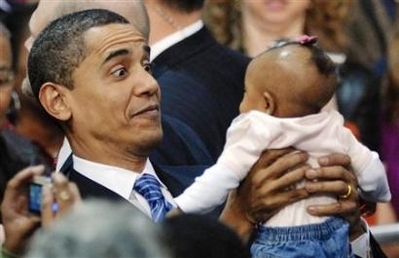 Every time some politician is running for office, there’s a parent out there, handing over the baby to be kissed. Why? Practically speaking, it’s a nightmare. Here’s a man who has shaken thousands of hands and been in huge crowds all day – a real germ magnet. And you’re taking the most precious thing in your world and thrusting it into those unwashed hands to be kissed by those unclean lips. What in the world are you thinking? Is it the “wow” factor? Do you want to be able to come to work the next day and say, “I met the president. In fact, here’s a photo of the president holding Junior.” Do we hope that some of the fame, or the “cool”, or the wealth of that person will rub off on our babies? Or is it a little nobler? Do we put our babies in the arms of those we respect and ask for their blessing because we hope that some aspect of that person’s life ends up “rubbing off” on our little child? Some of you have heard me say that I once shook hands with an old man who, as a child, had shaken hands with his great grandfather, who as a child had shaken hands with president Lincoln. That means there are only 2 degrees of separation between me and Honest Abe! Do those babies grow up knowing that they are connected, in some seemingly insignificant way, with these celebrities or role models? Do they care? Do you think it ever “takes”, and that the baby that was kissed ends up acting like the one who offered the blessing? Erin and Mike presented their son Tranter for baptism. What a blessing! I have some friends who would say that that’s all we’re really doing here, today. When we practice infant baptism, we’re offering little baby Tranter a photo op with Jesus. His parents will bring him forward, we’ll all stand around the water, a bearded man in a white robe will smile, probably cry a bit, splash the little guy, let him buddy up with Jesus for a few moments, and then he’ll go on his way. My friends would say that this is an insignificant little exercise that won’t affect Tranter in the least. I say that they’re wrong. When we bring him forward at this time, in this place, surrounded by these people, to this water, we are giving Tranter the gift of formally establishing his identity. We are, in essence, telling him who he is. We are bringing him into the presence of The Lord and of God’s people and inviting him to experience the reality of God’s grace even before he can say that amazing five letter word. We are formally starting him someplace. We are giving him a rock on which to stand. And in the months and years to come, Erin and Mike – and the rest of us – will need to remind Tranter of where he has been, of whose he is, and that to which he is called. In the years ahead, when Tranter doesn’t remember this day, we will be the ones to tell him that he is a child of God who is destined to be a servant of Christ. We might even say that just like that bottle you tossed into the right fork of Two Ocean Creek is bound to end up in the Pacific Ocean, so Tranter is pointed towards a life of discipleship because of the road we start him on today. ..it is certain that there is under ordinary circumstances a continuous waterway through Two Ocean Pass of such a character as to permit fishes to pass easily and readily from Snake River over to the Yellowstone or in the opposite direction. Indeed it is possible barring certain falls in Snake River for a fish so inclined to start at the mouth of the Columbia, travel up that great river to its principal tributary the Snake; thence on through the long tortuous course of that stream and under the shadows of the Grand Tetons enter the cold waters of Pacific Creek by which it could journey on up to the very crest of the Great Continental Divide to Two Ocean Pass; through this pass it may have a choice of two routes to Atlantic Creek in which the down stream journey is begun. Soon it reaches the Yellowstone … [and] through the lower Yellowstone out into the turbid waters of the Missouri. For many hundred miles it may continue down this mighty river before reaching the Father of Waters, which will finally carry it to the Gulf of Mexico, a wonderful journey of nearly six thousand miles – by far the longest possible fresh water journey in the world. The trout are in both rivers because they swam there. The water in Two Ocean Creek is deep enough to get them across the Continental Divide. Listen: the promise of baptism is not that Tranter will always make good choices, and that there will never be any flies in his ointment, and that his life is charmed and he is bound and destined to always know his place as God’s beloved child. The promise of baptism, for Tranter, and for me, and for you, is simply this: no matter where you may find yourself today, the water is deep enough to get you where you need to be. Grace does not end. The flies in your ointment may have caused significant damage, but you are not finished yet. There is plenty of water. There is always enough water. You can come home. In fact, the man who blesses babies, the man on the cross, the man who came out of the tomb, is calling your name. Counting on it. So keep swimming. Remember where you came from, and who you are, and where you are called. Thanks be to God. Amen. Popular Science Monthly XLVII (1895), p. 185. We continue with a look at a few of the more than 250 phrases that have come into common usage in the English Language as a result of the King James Bible (celebrating its 400th birthday this year). Our text for September 11, 2011, included Isaiah 2:1-5 (from the King James) and Matthew 5:43-48. I have a confession to make. I know that I stand before you as a confident and apparently capable man. I act like I’ve read a lot of books and have thought a lot of thoughts. But I’m here to tell you that was not always the case. Back in the day, when I was a student at Concord High School, I had a teacher who had the nerve to give me a “C” on a paper I’d submitted for English class. Me! A “C”! I thought it was a fine paper – and she gave me a “C”! I was outraged at the teacher, because I knew that when I got home, that “C” was not going to fly. The expectations in our home were a little different. Delaware is a flat coastal state, but all the grades in the Carver home were expected to be well above “C” level, I can tell you that. I tried approaching my mother with the notion that “C” was “average”, and “average” wasn’t bad – it just wasn’t great. But she was not interested in any such argument from her #1 son. It got worse, though, when I went back to school and happened to notice the paper that my friend had submitted. I don’t want to toot my own horn, but the reality is that my paper was as good, if not better than his – but while I was saddled with a “C”, he was over there sporting a “B”! Oh, the humanity! It’s not fair, I tell you. And, so far as I can tell, Jesus is pulling that same stunt in the section of Matthew we know as ‘The Sermon on the Mount’. I bet that you’re familiar with that section of scripture. He starts off with the blessings – the Beatitudes, we call them – in which he says some stuff that sounds pretty good, but is just a little bit off – it’s as if he’s indicating that he’s got something up his sleeve. In the passage you heard this morning, for instance, that is crystal clear. Jesus points to the old rule that says we’re supposed to love our neighbors even while we are free to hate the enemy. Well, that’s just common sense, Jesus. I mean, loving our neighbors isn’t always easy, but we’ll give it a shot. And besides, we can read that ourselves in Deuteronomy. Maybe, he says. But here’s the deal: you guys? I want you to love your enemies. I want you to pray for those who are seeking your harm. Why would we want to do that, Jesus? “So that you can be children of your father who is in heaven.” Do you see? There is a cause/effect working here. Love your enemies in order that you can become more like your Father. If we want to participate in the Divine Nature, it means that we are to become people of love. “Stick with me, then, friends. Stick with me.” Jesus does not soften his words or his tone for those who were closest to him. He sets the bar high – and then he runs right towards it. Where were you on 9/11? I was sitting in my study that Tuesday morning. We had just hired a new guy for the Open Door, a kid by the name of Zeisloft, and I was eager to train him. Cheryl Reed called and said that I better start praying – that a plane had crashed into one of the towers in New York. Glenn Mack called and wondered if I’d heard anything about a hijacking. We went over to Brian’s house and saw the events unfolding on live TV, as I’m sure many of you did. It was terrible, wasn’t it? The confusion. The panic. The fear. The pain. When I think back to 9/11, I am not overwhelmed with recollections of how loving and forgiving I was. And do we love our enemies? Have we prayed for those who seek our harm? How do I even dare ask that question, on this anniversary of that day? What gives me the right to look at those families and ask if they are filled with love and prayer? How do I even ask you that? It’s not my question, and I’m not the one who wants to know. It’s that irritating man on the cross who keeps asking all those questions. Are we a people who love our enemies? Who pray for those who persecute us? Who are perfect, just as God is perfect? Jesus is not inventing anything here. He’s not holding out some vision of peace that he is making up. He learned it. And, in part, he learned it from Isaiah. We often think of the Bible as the work of a schizophrenic God. In the first half, the so-called “Old Testament”, we think of a harsh, angry God, while the “New Testament” is more kind and loving. In the Old Testament, we seem to find a lot of smiting and slaying and sacrificing; while in the New Testament we are tempted to see Jesus as Mr. Rogers, who is meek and mild. Yet in the reading we have from Isaiah, there’s none of that anger or rage or devastation. There’s a verbal image in which the prophet says that God has a fundamentally good thing planned for this world. As a part of that, Isaiah says, people will beat their swords into plowshares. This month, we’re taking a look at a number of phrases that were brought into our language by the King James Bible, celebrating its 400th birthday in 2011. As David Crystal points out in Begat: The King James Bible & the English Language, the fact that this expression – swords into plowshares – has survived for 400 years is pretty noteworthy when you consider the fact that most speakers of English have very little contact with either swords or plowshares nowadays. Seriously. When is the last time anyone in your family owned either a sword or a plowshare? Yet the phrase continues to be used in many, many ways. That verse is carved into the wall on the building that houses the United Nations in New York City. Presidents Eisenhower and Reagan quoted it in some of their more famous speeches. The late Michael Jackson wrote about it in his song “Heal the World”, and the phrase surfaces in the musical finale of Les Miserables. There are statues depicting this all over the world. 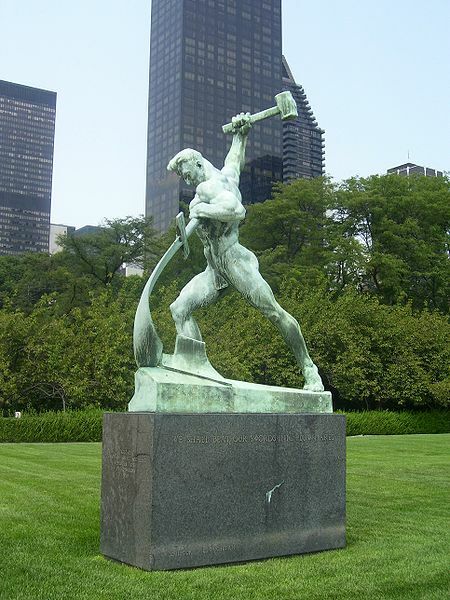 Swords into plowshares…while we don’t have much to do with either one of those items anymore, the notion of peace and productivity that it conjures up sure is attractive to us. What does it mean in context? What is Isaiah’s point in bringing these images together? In Isaiah 2, we read that God has big ideas for this world. And they center, says Isaiah, on Jerusalem. When he says that, you can hear the home team shouting! We love it when he tells us that we’re included! Jerusalem will be lifted up, says the prophet. And all the nations will come. Many people will fill that place, so that they can learn the ways of God and sit under his judgment. God will sort things out. It’ll be awesome. Do you see? It’s a great thing that God is doing…and it invites a response from his people. We are responsible for our own behavior, says Isaiah. Let us walk. We can’t take our presence at this party for granted. We, like everyone else, have got to respond – we can’t assume that because we are who we are, and we live where we live, and we come from where we come from…that we are automatically right where we need to be. In fact, what is at first heard as a really beautiful, celebratory, patriotic word actually ends up becoming an offense to the people who heard it first. Why? Because the people of God are not living by God’s intentions. The house of Jacob, says the prophet, rather than walking towards the future that God has, is turning away. The land is filled with idols. The people are oppressing the poor. This is not what God has in mind! The people of Israel and the followers of Jesus thought, in some ways, that they had an “in”. In fact, Jesus said, they were called to a higher calling and a more difficult road. How do we respond to evil and violence? What happens in your world when someone treats you scornfully? When someone attacks you? Forget? How could anyone forget? The question is not so much whether we’ll be able to call those terrible events to mind, but rather, what difference will that make? How does that that remembering shape you? What would our nation look like if you and me and a couple of million other people who claim to follow Jesus and listen to Isaiah decided that we were going to get a little bit better at the way that we deal with our anger and pain? What would happen if we decided that we were going to practice a little personal disarmament in terms of the ways that we reacted when we were targeted in one way or another? What if we began to pray for the people who attack us? And you say, “Carver, come on…the actions of a few people are supposed to change the world? You’re talking about a private response to a global problem.” And I suppose I am. Yet God, in sending Jesus to the world, and Jesus, in going to twelve people, seemed to indicate that there might be some wisdom in small groups of individuals deciding to engage in practices that can shape reality. Not everyone is doing it. I don’t think that is supposed to matter. It’s not easy. Jesus didn’t say it would be. The question is, in what way are you and I capable of responding to his word? And how will we do so? Amen. In 1603, the world was being shaped in all sorts of ways. Queen Elizabeth I, who had ruled England for more than 40 years, and who had presided over the rise of the British Empire and the flowering of the English Renaissance, was dead. 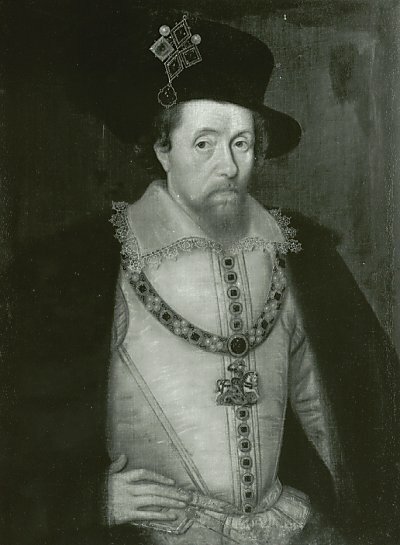 Her nephew, James VI of Scotland, was summoned to London to assume the throne as James I of England. Before he got there, he was accosted by a group of Puritan ministers, who presented him with a letter signed by more than 1000 Protestant pastors, who urged him to make changes to the Church of England. Not surprisingly, many of these suggestions were not well-received by the current leadership of the Anglican Church. James, perhaps seeking to buy himself some time and get the religious folks off his back for a while, seized on one of the suggestions: the creation of a new English translation of the Bible. If he could get the Puritans and the Anglicans working on that, he must have thought, they’d fight with each other and leave him alone. For seven years a committee of 47 scholars worked to develop a translation that would serve the church well. 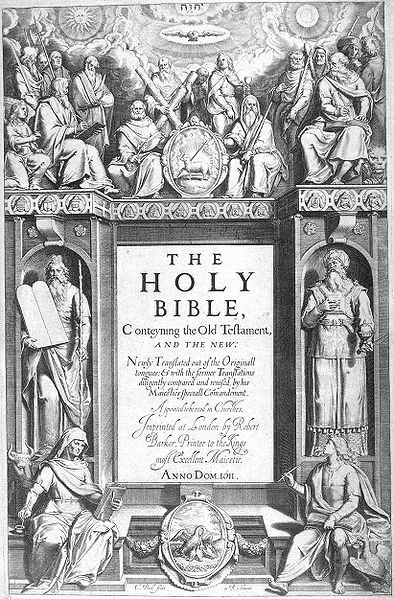 The result, published in 1611, was called “The Authorized Version”, and we know it as “The King James Version”. It has been called the single most influential book in the English Language, and last week we noted that more than 250 current phrases and idioms that can be traced back to this work. Many of these expressions are used by people who have no idea that they are, more or less, quoting scripture. As you heard a few moments ago, that phrase is a direct quote from Matthew 4:4 (and, coincidentally, Luke 4:4). Jesus is referring to Deuteronomy, which according to King James says that man does not live “by bread only”. All three references, of course, are making a larger theological point: to be human is to exist as someone with physical needs, but spiritual needs as well. We cannot ignore one area to the detriment of the other. We are one being consisting of body, mind, and spirit. The Apostle Paul makes much the same point in his letter to Timothy, using two phrases that have become a part of our daily speech: “You can’t take it with you” and “the love of money is the root of all evil”. Paul is reminding Timothy to take a balanced view of life, warning him against greed and selfishness. A recent survey posed that question, and, not surprisingly, the overwhelming answer was, “for the money.” Oh, there were a number of answers that were brought forth, but most folks indicated that the reason that they got out of bed every day and went to their place of employment was the fact that they were being paid to do so. But if you think about that for a moment, you’ll realize that there’s something missing. Money is, itself, meaningless. And if the portions of the Bible you’ve heard are correct, then saying “I work for the money” is insufficient. After all, if “man does not live by bread alone”, and “you can’t take it with you”, and “the love of money is the root of all evil”, then we need to ask a deeper question. Why do you work? For the money. Well, what does money do for you? It gets me stuff. For most of us, our jobs are not so much about the money that winds up in (and out) of our bank accounts, but rather about what that money makes possible in our lives. The food we eat, the places we stay, and the toys that amuse us throughout the day. For most of us, work is a means to an end. And for most of us, that “end” is measured by the pile of stuff that the work allows us to accumulate. But I think that understanding of “work” is limited and cheats us out of a way to see ourselves as partnering with God in the task of creation. Work is fundamentally a good thing. When I typed that sentence on my laptop, it came out “work is a ‘god’ thing.” Both of those sentences are true. I know, that’s not the way we see it culturally. “I owe, I owe, so off to work I go…” I got more than 42,000,000 hits in less than two tenths of a second when I googled “I hate my job.” But I am here to tell you that work – our job – is a means by which we can understand what it means to be human and a child of God. In Genesis, we read that God spent six days creating. Six days working to create or produce a universe. And a significant part of that creation, we understand, is humanity – which Genesis says is created “in the image of God.” To be human is to be like God in some way. And if God is a worker, then humans are, too. God puts Adam in the Garden of Eden and gives him a job to do. In our work, we are able to connect with the image of God that is anchored deep within us. Our work allows us to share with God in creative activity as we care for the earth, serve our neighbors, and provide for our families. But you know, of course, that it is not all sweetness and light. The same Genesis that tells us that God gave Adam a job to do also describes the entry of sin into the world and the ways that sin interferes with our ability to live fully into the image of God that is within us. Our work, like the rest of creation, has been affected by the brokenness of sin. 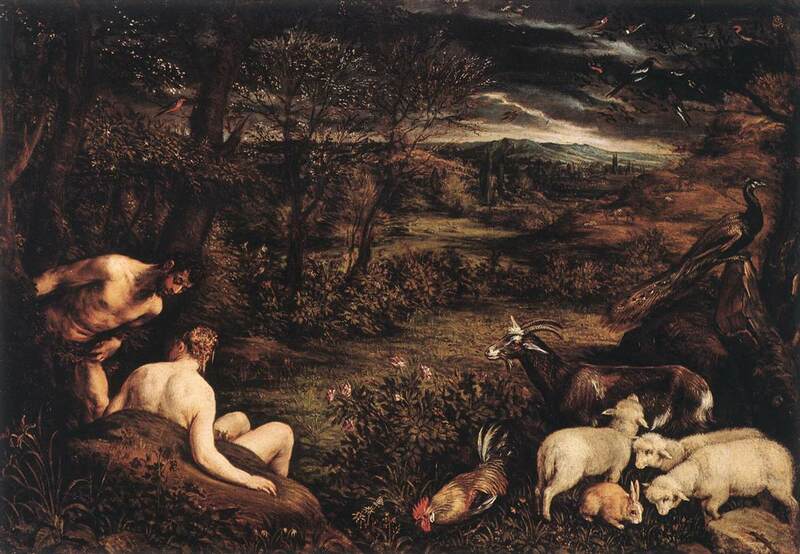 Genesis 3 describes the conversation between Adam and God after the Fall, indicating that from then on, Adam’s work will be different, and he will earn his living “by the sweat of his face”. Before and after the world experienced sin, Adam had a job. But his experience of that job was irrevocably changed by sin. Now let me stop myself there and make sure that we understand that even though I have been using the phrase “having a job” and “work” interchangeably, they are not necessarily the same thing. Many of us have jobs – that is to say, many of us are paid to work by someone else according to that other’s schedule, priorities, mission, etc. But all of us work. All of us expend some portion our time and energy in some form of creative and productive endeavor. Often, we work as employees somewhere. But ask a retiree who is busier than ever how much he likes “not working” any more and you’ll see what I mean. Talk to a stay at home mother about how nice it must be not to have to work – but stand back when you ask that question. Think about the energy that you or someone you know has put into a tomato patch or a flower bed this summer…I don’t know anyone who has gotten paid for that, but I can’t think of anyone who hasn’t worked while doing it. So this Labor Day, let me ask you how you use your time and energy. I hope that I’ve demonstrated that you all work (my sense is that nobody needed much convincing of that…). How do you work? Why do you work? As we observe this holiday weekend – most of us who are employees somewhere don’t have to show up tomorrow – can we spend a little time wondering what it would mean to participate in a world where everyone’s time and energy were valued? I know, that’s a pretty big question, especially if you were really hoping just to throw a few burgers on the grill, catch the game, and maybe cut the grass. But the reality is that a part of how you were made – and why you were made – is that you work. You create. You invest. Allow me to suggest two simple notions that might help us grow in our ability to work as Christians and to express that work in ways that are a blessing to the world around us. First, can we agree that it would be a good thing if we refused to take advantage of the oppression of other human beings? The newspapers today are filled with advertisements for our “back to school” needs. School clothes. Tools. Office supplies. Some of these deals are just outstanding. But some of them are, I believe, rooted in injustice. I don’t want to buy a television set if I have reason to suspect that it’s been assembled by nine-year-olds working in deplorable conditions. Sure, I’d love to save money on a new suit, but not one that has been put together in a sweatshop. How can I spend the fruit of my labor (that is, the money I receive for working at my job) in such a way that essentially steals dignity or value from another person? If I am going to live into the image of God as a worker, it must be as I help you to do the same. Secondly, can we decline to participate in that which destroys, rather than sustains, life in the universe? Several years ago, for instance, I discovered that a company in which I had inherited a couple of hundred dollars worth of stock was doing business in ways that profited from cruelty to animals and abuse of the environment. I don’t know much about the stock market, but I knew that I didn’t want to be considered as a part owner (no matter how miniscule my “share” was) in an enterprise that brought this kind of damage to the world. Remember that restaurant in England? While I was researching them, I discovered the Gonnella Baking Company of Chicago. Their motto is “We Bake To Differ.” Now, I don’t know anything about this company, but that got me thinking. What if they are really serious about that? What if, in having that slogan, they are saying “We bake in order that the world might be a different and better place?” Wouldn’t that be working in such a way as to live into the truths of scripture? But why should I put that onus on a company I’ve never encountered before? What if each one of us looked at our work and said, “I clean to differ”, or “I teach to differ”, or “I bank, I write, I garden, I serve…”? Do you see? On Labor Day, can we commit ourselves to using our time and our energy in ways that do not oppress and that do not damage? Can my job – and this stuff on which we do not live and that we can’t take with us when we go that I get from doing it– be a part of me making a difference in the world? And, because we are related to each other, can I further suggest that I apply that company’s motto to every area of my life? “I shop to differ…I hire to differ…I tip to differ. I pay taxes to differ…in other words, I spend to differ. I use who I am and what I have in order that God’s creative purposes are more likely to be realized in the world…” If I lived that way, then the fruit of my labor would be, in fact, spent well and wisely. You can’t live by bread alone. Nope. But it’s a good and valuable thing. You can’t take it with you. Nope. But you need some of it today, most likely. So do I. So do our neighbors. Perhaps the goal that we might set for this Labor Day weekend – and beyond – is to live into the first part of the reading from Timothy today: to work towards “godliness with contentment.” May we receive this day what we need. And may we offer what we can. May we find our energy and time making a difference in Godly ways. And may we know the blessing of God in and through those practices. Amen.